It returns isFirst = true/false by checking session value. If it is true we will reload browser window. 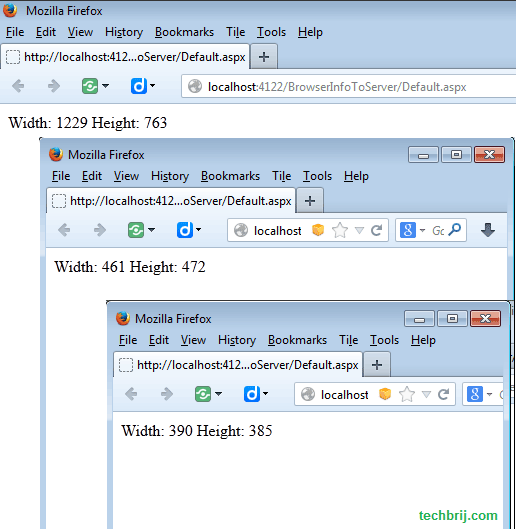 We will get browser width and height from Session variables. We have implemented to get browser width and height on server side. It is very useful to implement server side logic for responsive web design. Share your opinion in the comment box. Enjoy programming!! Thanks for the clean presentation and a first time sucessfull execution in my project! Same here … I get “Problem to retrieve browser size” … any ideas on how to debug that? Is your handler .ashx is located at the root directory as your .aspx file? If not, include in the folder name. great article; just what I needed! I tried to implement this when Default.aspx is a content page referring to a Master page. I put the Session code into the master page’s Page_Load event. There are no errors but the label’s text does not get updated either. Could you please indicate how this approach changes when using a master page? How did you resolve that issue?, an error is apparent on my screen saying ” This site says… Problem to retrieve browse size” and the label doesn’t update either, also I can’t debug the js. file, any suggestions?